With classic works by Olivier Messiaen and forward-looking pieces by living Australian composers, the final night of the Metropolis New Music Festival straddled over 75 years of new music. Building on the festival theme of “the city” with two world premières, Metropolis finally addressed issues of migration and the unique environmental and social predicaments of Australian cities. The term ‘skyscraper’ once implied ‘progress’. To my mind—and thinking not only of my own generation, but of our children’s and their children’s—’progress’ has become a dubious word. So emerges this work’s title, Sky Jammer. I don’t entirely agree with Bakrnčev. With their stunning density and vacancy, Melbourne skyscrapers are deservedly symbols of Australia’s inflated housing market and disregard for community health. However, building up is one alternative to Melbourne’s addiction to building out across the countryside. But the more densely a city is developed, the more planning is necessary to ensure the city is healthy. And in Melbourne, home of bike lanes on raised tram stops, I hold out little hope for a renaissance in enlightened civic planning. Sky Jammer is a local and contemporary piece in more than its program. Its sound so clearly draws on the compositional influences around Bakrnčev. In its dense, rapidly-changing textures one can hear the influence of Australian complexist composers. The instrumental timbres have the grit of a piece by Anthony Pateras. With its attention to instrumental colour and formal cohesion one can hear the influence of Bakrnčev’s teacher Elliott Gyger. Though this description might make him sound like the love-child of dour modernists, Bakrnčev brings his own crowd-pleasing style to the piece, in particular during a virtuosic violin solo for Sophie Rowell, who needs to be congratulated for several incredible solo passages throughout the festival. Two works by Olivier Messiaen took the festival theme skyward. Couleurs de la Cité Céleste evokes the jewel-encrusted walls of the Heavenly City descending to Earth after the apocalypse. Scored for a large ensemble of brass, woodwind, percussion, and piano, the sheer volume and violence of the music is more apocalyptic than sublime. For a composer so sensitive to tone colour, the piece has a notable absence of resonance. Only bells ring out across the auditorium. The brass—evoking the seven trumpets of the apocalypse—announce the end-times in gigantic clusters while the keyboard and keyboard percussion piece together a mosaic of dry attacks. It is a flat, medieval representation of the Heavenly City rather than a scene of shimmering fanfare. The MSO’s Guest Conductor Robert Spano did not hold back from Messiaen’s vision. In his interpretation each tutti chord is so loud you can hardly bear to listen to it—like looking into the sun. This is perhaps Messiaen’s idea: to paint the cataclysmic aura around a city that shines so brightly you cannot look directly at it. The most dedicated audience members stayed on for a precious event: Aura Go and Tomoe Kawabata’s late-night performance of Messiaen’s Visions de l’Amen for two pianos. Where one can sometimes question individual players’ commitment to new music in an orchestral concert, Go and Kawabata’s performance was positively ecstatic. Locked on to each other’s gaze across the bodies of the two grand pianos, sweat dripping onto the keyboards, each movement was a masterful, sensitive interpretation of Messiaen’s understanding of the polyvalent “Amen”. Returning to this work composed shortly after the Second World War, at the dawn of the experiments in form, rhythm, pitch, and timbre we call “contemporary music,” was the perfect nightcap for a thrilling festival. Rubiks set up for Morton Feldman’s Why Patterns? on a steaming-hot December evening. Forest Collective teamed up with their ensemble in residence Rubiks to provide a folk-inflected final concert of 2015. Michael Bakrnčev’s The Virtuous Woman with the Watermelon is a lighthearted piece for narrator and small ensemble based on a Macedonian folk tale. Commissioned expressly for this concert, the piece was an appropriate companion to Berio’s Folk Songs. The narrator (Stefanie Dingnis) tells the story of the ideal married couple receiving visitors, but all is not as it seems. The fussy husband constantly sends his wife back to the market to buy a better watermelon for their guests and the wife simply returns to the kitchen and polishes the watermelon until the husband declares that she has indeed found the very best watermelon in town. I’m not sure what the moral of the story is. Don’t be a demanding partner? Do make pragmatic shortcuts? “The husband and wife are a team” explained Bakrnčev after the concert, the story hinging on our guessing at the husband’s knowledge of the wife’s actions and the slow transformation of the meaning of the word “virtuous” in the story’s title. Bakrnčev accompanies the story with a mock-military march. A flute trembles stertorously over a snare drum. At one point the narrator vocalises beautifully over a cheery piano tune. Next to the Folk Songs Bakrnčev’s musical accompaniment sounded very light indeed. There is always time for another performance of Berio’s Folk Songs. In arranging eleven folk songs from the United States and Europe (including two original compositions), Berio sought “a unity between folk music and our music.” I assume that by “our music” he means contemporary art music rather than the classical tradition more broadly. Berio surrounds the folk tunes with an atmosphere of extended techniques evoking natural environments. Thorny instrumental interjections paint a sound-world far removed from the singing tones of a modern orchestra. Does the listener really hear the spirit of ancient music brought alive to modern ears, or a fantasy of a lost world? Whether real or imagined, in 1964 Berio constructed a bridge between pre-modern tones and the overblown, underbowed techniques of contemporary music. This bridge has since grown to a widely acknowledged superhighway between early and contemporary music. The Folk Songs may have been a striking statement in 1964, but this conduit has now passed over into ideology and is ripe for interrogation. Today’s culturally-aware listeners are sensitive to issues of cultural appropriation. Performers need to carefully balance their preconceptions of ancient and modern music. Too “folksy” a performance and the performance will slide into parody, too straight a performance and the songs will lose much of their appeal. Stefanie Dingnis chose a relatively restrained performance style, letting the beauty of the tunes speak for themselves. Dingnis came alive in the Sicilian song “A la femminisca” with its clashing, explosive opening that cannot be mistaken for anything but an invitation to let loose. The ensemble, conducted by Evan Lawson, provided plenty of colour in their masterfully balanced accompaniment. The sensitive articulation of harpist Samantha Ramirez and thrilling execution of the piece’s signature viola solo by Anthony Chataway deserve special mention. Listening to and watching old recordings, I wonder whether anyone could or would want to perform the Folk Songs with the same accents and dance moves today as the Songs‘ dedicatee Cathy Berberian. The concert also included a stunning performance by Nicholas Yates of Berio’s Sequenza VIIb for soprano saxophone. 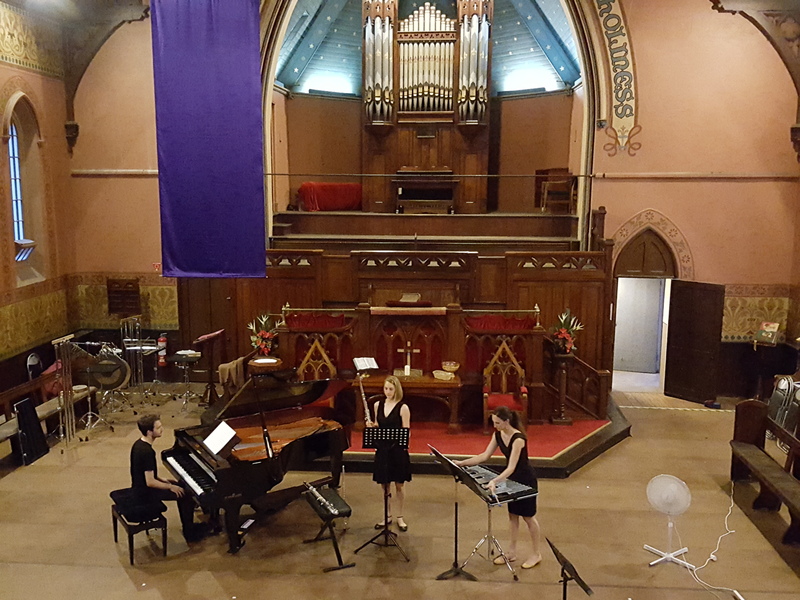 The piece’s drone was provided by string players spaced around the Richmond Uniting Church. So subtle was their movement and quiet was their playing that I became conscious of the ethereal sound over a minute or so. What a beautiful effect. Yates’ agile execution of the popping, pointillist piece was something to behold! The concert concluded with Morton Feldman’s Why Patterns? performed by Rubiks Collective. Jacob Abela (piano), Tamara Kohler (flute), and Kaylie Melville (percussion) move through their sparse parts at their own rate, coming together at certain vertiginous moments. These meeting-points become moments of great focus as the performers become aware that they are a page or so away from each other. The performers have to make so many decisions in executing their part that I was put in mind of Alistair Noble’s recent lecture on Feldman at the Melbourne Music Analysis Summer School. Noble argued that, given the tight-knit community within which Feldman’s works were composed and performed, he assumed a certain stylistic palette when composing indeterminate elements in his works. For the most part we cannot hope to—and may not want to—recover the assumed stylistic traits of the early performances of Feldman’s works, but there is certainly interesting work to be done in that direction. Michael Bakrnčev, The Virtuous Woman with the Watermelon; Luciano Berio, Sequenza VIIb, Folk Songs; Morton Feldman, Why Patterns?